Why is the Robuskey keyer different from your normal chromakeying plugin? The plugin uses a chroma key algorithm developed proprietarily by ISP that is specifically matched to people's hair characteristics and skin tone. The results of the footage shot on a Canon DSLR do look pretty impressive keyed. Look carefully at the hair and the transparency in the dress and glass. The video was produced before FCPX was released, but we get the quality of the key that the plugin can produce. We first came across the product on a Japanese website and through some questions we found out that the plugin is available from Toolfarm. The price is a hefty $428 so it is not going to be an impulse buy, but if you can't get a decent key in FCPX or Final Cut Pro 7 then it might do the trick. 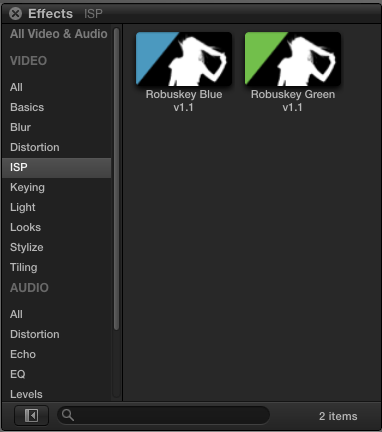 "ROBUSKEY for Video is plug-in for Adobe After Effects, Adobe Premiere Pro, Apple Final Cut Pro and Grass Valley EDIUS. The plug-in was created in response to requests from creative professionals for a tool that would make it easier to cut out a background and create more visually appealing composites. Matting is possible even if the video is shot under non-ideal conditions, such as weak lighting, wrinkles or shadows on the background, or too small of a background. Matting work and time are cut considerably. The plug-in can be used not only when editing the video but also when actually shooting it." "High-precision mattes can be created simply by selecting the main subject in the scene with one click. The software accurately identifies human skin and hair and even beautifully cuts out translucent materials like lace and glass. Supports high-definition video over 4K. Available for professional use, such as movies and CM films." Remember that at the moment there are no plugins available directly in FCPX. These are plugins applied to MOEF (Motion5) wrappers that are saved as Motion templates.